My neighbor brought me an Amish Friendship Bread start and I was able to make some for the first time! I remember my mom making it once when I was little and I was excited to get to do it myself. It was a fun thing to do, but when I went to deliver my starts to my friends I realized that my copy of the recipe was all dirty. 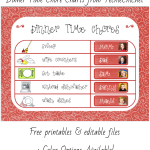 I didn’t want to photocopy it in that state, so I did the only logical thing and redesigned it to be cute and prepared it to post on my website 🙂 Hopefully this will save the next people from having to decide between photocopying a dirty recipe and having to recreate the document themselves. 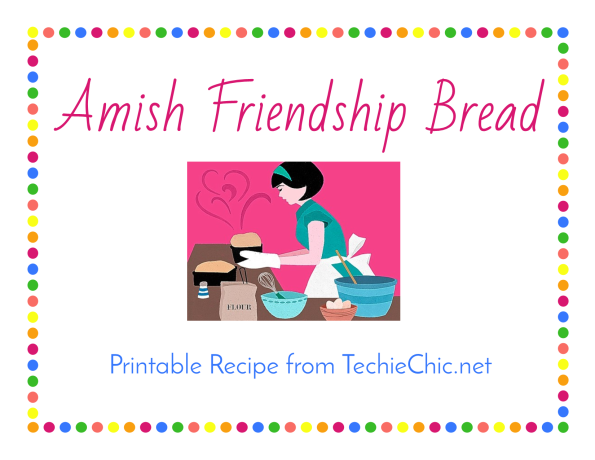 You can get the printable copy here – Amish Friendship Bread Printable. Also, if you’re like me and got to the last day and discovered that your instant pudding boxes are 3.9oz instead of the 5.1oz called for, I’ve done the math for you so that you can use the right proportion of the 3.9oz boxes. Just combine 2 3.9oz boxes of pudding and remove a generous 1/3 cup of pudding mix and set aside. The remainder is what will go with your bread. If you would like to make pudding from that 1/3 cup of mix (because, pudding is delicious), just mix you 1/3 cup of pudding with 2/3 cup of milk and whisk for 2 minutes. Here’s a text copy of the recipe as well if you just want to see what this is all about. Don’t be scared by the 240 hour prep time… the vast majority of that time is spent with a ziploc bag sitting on your counter! 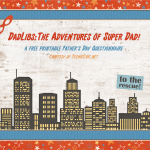 If you want to print it though, use this version, it’s much prettier! Optional: add nuts, raisins, chocolate chips etc. Day 1: Receive the bread start. Do nothing. Day 6: Mix 1 cup flour, 1 cup milk, & 1 cup sugar in a bowl. Add to bag. Knead to combine. To Make the Bread: Mix 1 tsp cinnamon and ½ cup sugar together, set aside. Spray 2 smaller bread pans with cooking spray. Sprinkle the pans with cinnamon and sugar mixture. Bake at 325°F for 45-60 minutes. Let stand for 10 minutes before removing from pans. Amish Friendship Bread printable recipe here.